Welcome to the Des Plaines Vanguard Website! Whether you're a fan who was fortunate enough to have seen and admired the Vanguard back in the 50's, 60's and 70's, or someone who never had the opportunity to see them, or even if you just competed against them, sit back, relax and take a journey back and see what the Vanguard (and drum corps itself) was all about in the 50's, 60's, and 70's. Please enjoy your visit, make sure and sign the guestbook, and come back often! There are many more big updates planned for this site in the next few months! The Vanguard was known as a corps that loved being in the forefront, and was never afraid to take chances - whether that meant taking chances in musical presentations and arrangements, percussion, marching and maneuvering, visuals, personnel, or even in their uniforms. 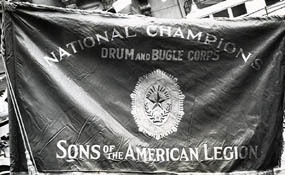 The Vanguard was a major icon and a major influence on what is now considered modern drum corps. The highly talented and powerful horn line, the skilled and innovative drum line, the inspiring M&M shows, the colorful and highly regarded color guard and all of its major innovations were all trademarks of one of the best junior corps of the 60's and 70's, which was so aptly named "Vanguard". The corps itself is gone, left now to photographs, recordings and discussion groups. But the Vanguard also left with us a multitude of great memories for all of that followed them. But the greatest and fondest memories of all will always reside in the hearts and souls of us who were fortunate enough to have ever had the opportunity and the privilege of wearing that colorful red, black and white uniform, and to be called a "Vanguard". ©2019 Des Plaines Vanguard 526 Alumni | This website is best viewed at a resolution setting of 1024 X 768.